Ryley Walker at Space, Evanston, IL, 2/1/2017. Openers We/Or/Me at Space, Evanston, IL, 2/1/2017. Acoustic string-plucking savant Ryley Walker has remained as innovative as he is prolific, releasing a new LP every year since 2014. August release Golden Sings That Have Been Sung honed the singer/songwriter’s improvisational finesse into sharp folk missives that expand and contract at all the right moments (check “The Roundabout”). Live, the free-wheeling troubadour elevates that art into a startlingly intimate ceremony, every comparison to Nick Drake and Tim Buckley earned. The Chicago native hopped to the Evanston suburb last week alongside percussionist Ryan Jewell and guitarist Bill MacKay. Photographer Sarah Hess spent the day with the Walker crew and also shot some picture of openers We/Or/Me. 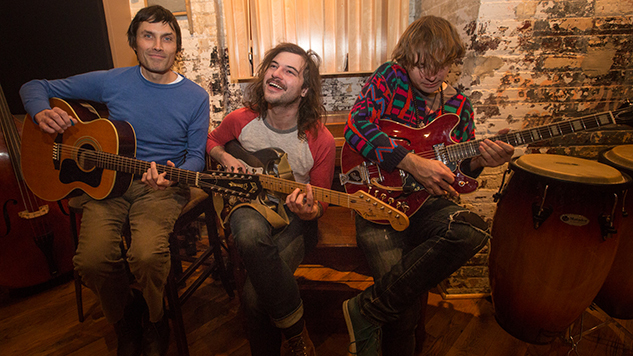 Ryley Walker is currently on tour in the US before an extensive jaunt through Europe.